We got up, got moving, and walked down to St. Bart’s Cafe for a solid breakfast before the boarding insanity. Then we headed back, checked out, and tried to catch a cab to the port. After 20 unsuccessful minutes, as we were about to give up, the hotel manager came out and got us one on the first hail. 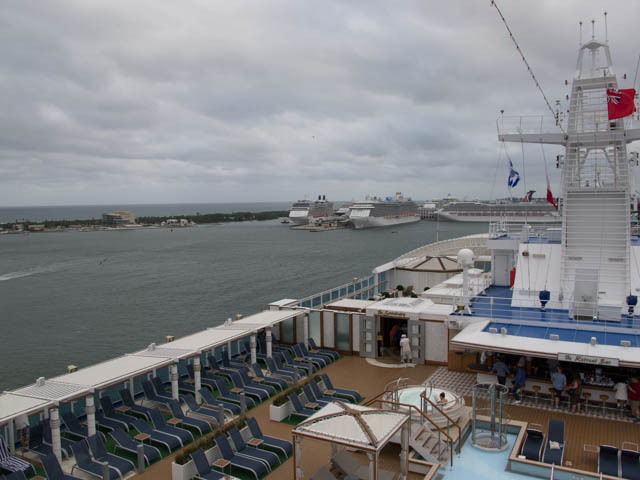 The trip to the port was an adventure, because with eight cruise ships unloading and loading at the same time, the port was significantly overloaded. Check-in was actually more efficient than I recall our previous cruises were, and despite the crowds, we were on the Royal Princess relatively quickly. We got settled in to our cabin, an interior on the Marina deck, and then set out to get lunch and explore. Lunch was in one of the main dining rooms, where both Heather and I ordered an antipasto consisting of pickled vegetables and hard salami. For our main courses, I had beef tenderloin and Heather had a chicken cacciatore with pasta. Finally, for dessert we both had an apple tart. After lunch, we found a quiet spot so that I could call one of my credit card companies to notify them that I was going out of the country. I’d forgotten to do it before we left, and it turned out to be a good thing as they’d turned the card off due to a significant number of fraudulent charges that came in overnight. The problem was that the card in question was the one I had set up for the ship’s billing. So after taking care of getting a replacement, it was down to passenger services to put a different card on the account. Having taken care of that, we went back to our cabin to wait for our luggage and get ready for the safety muster. All of our bags arrived, and everything was intact, so the last major worry was gone. By then it was time for the safety muster, which is mandatory for all passengers, no matter how many cruises they have under their belts. From there, we went back to the cabin, dropped off our life vests, and went topside for sail away. The wind was still rough, but it was worth it to watch us sailing out as the first of the eight ships leaving that day. And hearing both Princess ships’ horns playing the theme from The Love Boat was great. We then explored some more and went back to the cabin to unpack and get ready for dinner. We chose the any time dining because, for us, a fixed dining time just didn’t work out. Tonight we started out with red snapper ceviche for me and fresh melons for Heather. Our next course was a chowder for me and a caesar salad for Heather. For our main course, I had a flank steak done in a Caribbean style and Heather had pork tenderloin with an apricot sauce. For dessert, I ordered a mango cheesecake and Heather had a flourless chocolate cake. With full bellies, we retired to our cabin to relax and get ready for tomorrow.